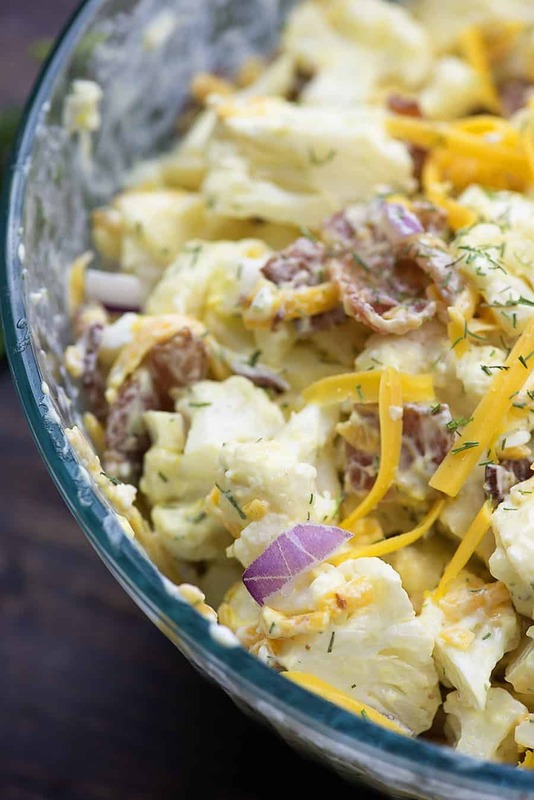 This cauliflower potato salad is loaded with grated cheddar and crispy bacon. I love easy summer side dishes like this and it’s perfect to serve along any grilled meat or at your next potluck. My grandma made the best potato salad. My mama makes the best macaroni salad. We have a thing for the cold salad sides in our family, is what I’m saying. The only problem is that they generally tend to be full of carbs and that doesn’t fit into our low carb life all that well. 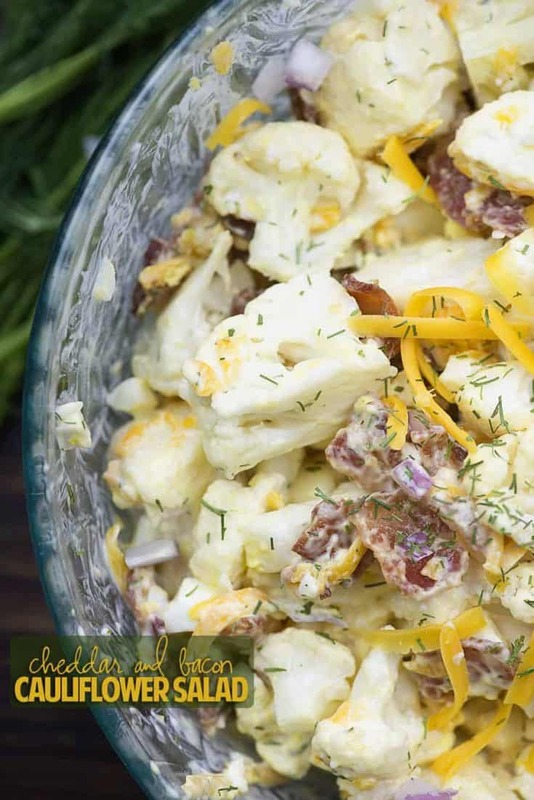 My mom makes this fabulous keto coleslaw that we eat all summer long, but we definitely needed a new go-to side for those summer barbecues! 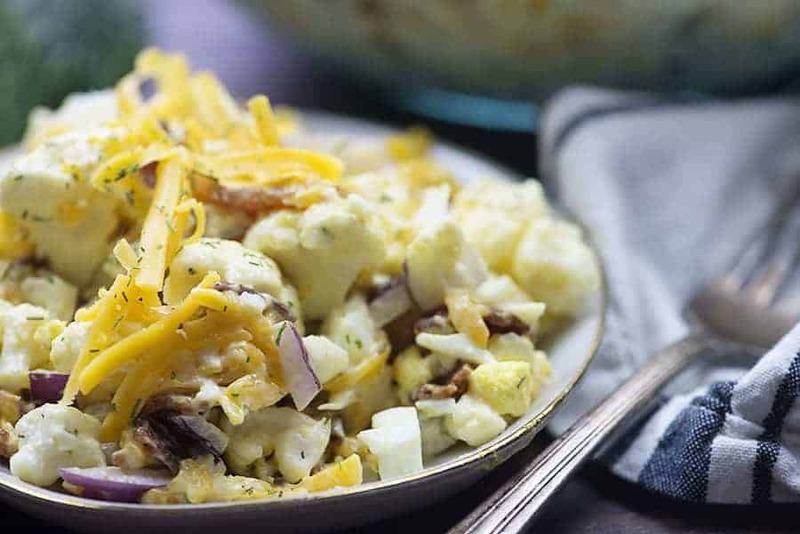 Enter this cauliflower side dish. It is LOADED with good stuff and, if you’re missing potatoes, I think you’ll really like this one! No, it certainly doesn’t taste exactly like “real” potato salad, but it totally has that vibe going on and it works for me. We love it and I think you will too! Can’t you just imagine this served at your next barbecue? 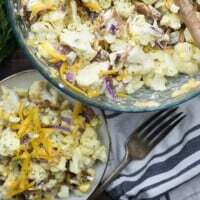 Grilled chicken or perfectly cooked steak and a big ol’ side of this flavor-packed cauliflower salad. 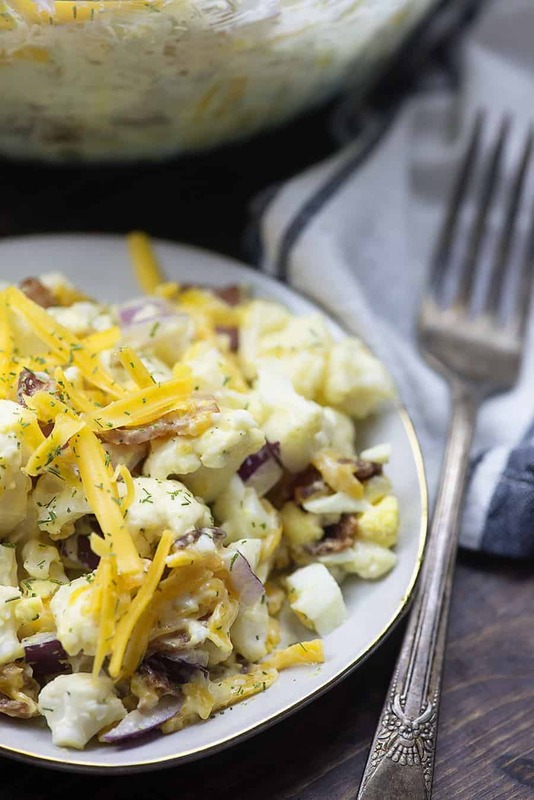 This easy cauliflower recipe only takes about 15 minutes to throw together. This low carb cauliflower recipe starts with a head of cauliflower. Chop it into bite-sized chunks and steam until as tender as you’d like. I prefer the slightest bit of crunch. 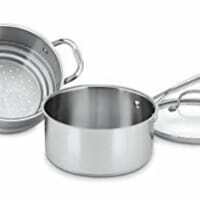 I use this steamer set (affiliate link) to steam right on my stovetop. 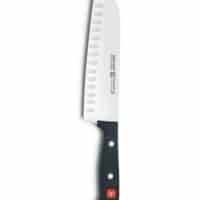 Super easy to use and veggies steam in about 5 minutes. 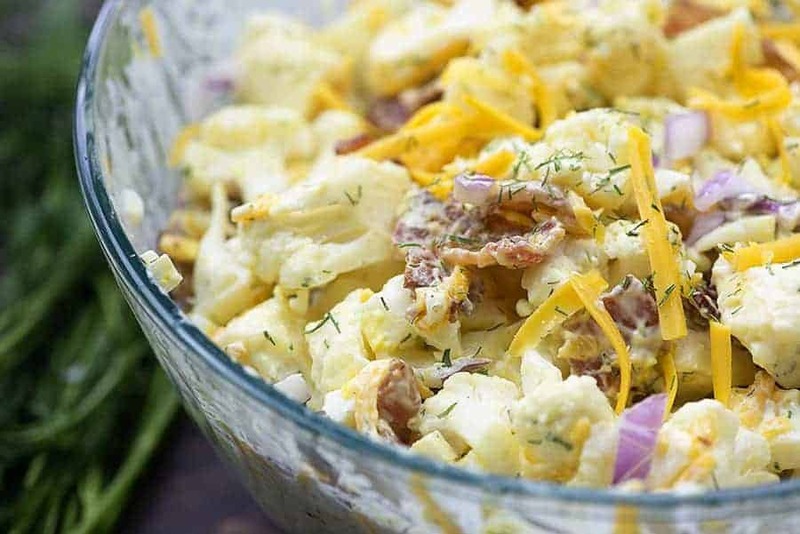 The cauliflower then gets tossed with some good stuff – mayonnaise, a little mustard, boiled eggs, and a bunch of crispy bacon and freshly grated cheddar. Speaking of mayonnaise, do you have a preferred brand? I am a total mayo person. I LOVE the creaminess it lends to everything and I add it to everything. No shame here. I usually go for Kraft brand mayo. It’s what I grew up with and I still love it. Duke’s mayo gets so many rave reviews and they just started carrying it in my grocery store in the midwest. 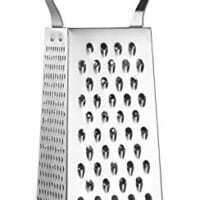 I flirted with it for awhile, but I still usually go back to my Kraft. Curious what brand you love best? Anyway, I hope you guys try this recipe. You’re going to love it! 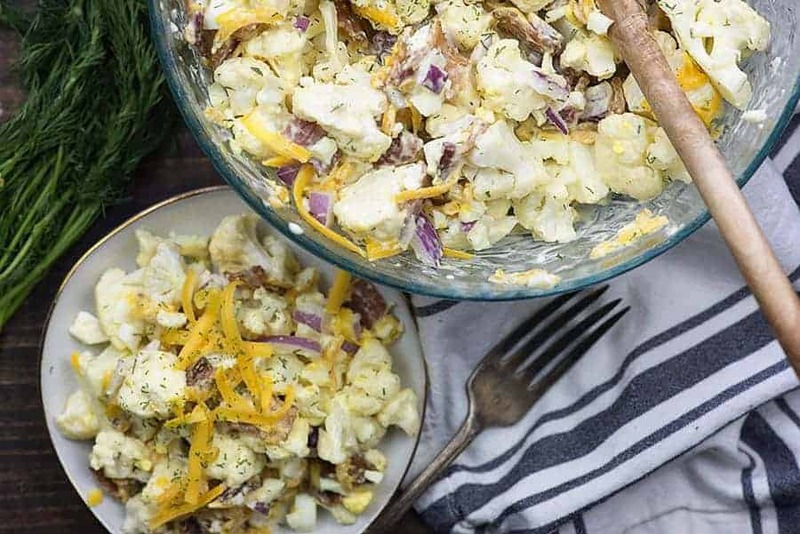 It’s really hard to go wrong with this cauliflower potato salad. Chop the cauliflower into bite-sized pieces and place in a steamer basket. Steam for 3-5 minutes or until tender-crisp. Add the cauliflower to a large mixing bowl and place in the fridge to chill for 2 hours. Add the remaining ingredients to the bowl of cauliflower and stir well to combine. Sounds good. But definitely with Hellman’s and one or two spoons of miracle whip!! Is this like real potato salad in the way that it tastes better the 2nd day? It does give the flavors time to develop more and will taste a bit better the second day, but sometimes cauliflower starts to stink after it’s been cooked a bit. Soooo, I usually serve it the same day because I hate the smell of cauliflower. Ha! Sorry if that’s not very helpful! Thank you for this amazing recipe! My family loved it…. didn’t even miss the potatoes. I added some green onions, a bit of chopped red pepper, and cut the cheese into chunks rather than grate it, and doubled the amount of eggs…. it turned out awesome! The recipe is a keeper, for sure. What a good substitute for potato salad. How much is the serving size approximately ? 1 cup, 2 cup ? I did not measure by volume – just divided it into 6 servings. Looks great…is the mustard yellow mustard or spice mustard? I like a little crunch and color in my “potato” salad so I added some celery and some green or black olives ( depending on your preference). Tastes delicious. Sounds fabulous! Any suggestions for a mayo substitute? I have a friend who won’t eat it. No, I’m sorry, I only ever use mayo in cold salads like this. Not sure what a good sub would be. this sounds incredible. i miss potato salad – although i’ve discovered that what i really like (salad and elsewhere, like a big deli sandwich) is onions and mayo. 🙂 Best Foods/Hellmans, if you please. Going to make this tonite. Perfect salad! Made my own mayo using a no fail recipe (inspired taste blog) and it really made this salad yummy. I like the cauliflower a little bit crunchy- blanching for no more than five minutes was a great idea! Any suggestions to substitute the dill please?? my family don’t like dill. You can just leave it out or add parsley instead.